It seems to be a requirement that if you have a blog that you have to do an end of the year post, so here is mine. A lot has happened in the last year. A lot has changed. Graduating from university in May was a big enough deal on its own, never mind everything thing else. It was a little more than 10 months ago that I started interviewing for my job. After hours of phone interviews and a trip to Scotland, I accepted the position in mid March. Then all the visa issues came up. I studied for and took the LSATs while all of that was going on. There were trips to Hilton Head and Orlando. I finally moved to Scotland in the first couple of days in September. I was homeless for a couple of days too. I've been to London twice, Munich, Salzburg, Vienna, and drove through Bratislava quickly. In 2009, I got to meet a lot of interesting people and go to a lot of interesting places. It was an exciting year and hopefully 2010 is even better. Merry Christmas to all my readers. I'm back in the US right now after flying home Tuesday. Its just as cold, if not a little colder, than Scotland. Looks like I didn't luck out. Another thing I had to eat in Austria was a Kasekrainer. It is a klobasa sausage that has some cheese in it. It is served in a baguette that is cut open at the one end. Some mustard is added as the sausage is slid in. In Vienna, I discovered Langos, which quickly became one of my favorite festival foods. A langos is a large, fairly flat piece of dough that is deep fried. It is then coated with a garlic butter spread. They're great and I had two of them from Vienna's Christmas Market. This has become one of my favorite Christmas songs, but the video is really strange/creepy. Why he is even trying to dance? Who decided that Santa was the way to go? The Santa is really creepy and not just in an awkward 80s kind of way. Check out the kids reaction at 2:50. Also, whats up with the weird female adult-sized elf that shows up at a couple of places? Is she wearing makeup or is she just that ugly? I took a couple short videos with my digital camera of the Glockenspiel at Munich's Neues Rathaus. Everyday at the top of a couple of select hours, the clock has some mechanical figures that put on a show. This video is pretty good. It's a charity video featuring the voices of all the original actors. Some of the characters are pretty obscure though, at least for someone who didn't grow up in England. The past ten days or so have been pretty eventful. The lease on my flat ended last Friday so I had to move out. The problem was that I couldn't move into my new flat until Monday. The letting agent claimed I couldn't move in until they received a reference letter from my bank. I pushed them on this and they agreed that I could move in on Monday. Somehow this requirement disappeared with no explanation. I still don't know if they ever got the letter or not. This left me basically homeless over the weekend. I had arrange for my one coworker to store my stuff and I was going to stay with another coworker. However, when he went back to his flat Friday night, he found out that he was being temporary evicted because they had to do emergency repairs to the shared wall between him and his neighbor. I became homeless twice in one day. When I eventually moved into my new flat on Monday, I quickly founded out that night that the central gas heating did not work. The whole flat got very cold very quickly. Luckily I had purchased a new duvet early in the week. Without it, I would probably have froze to death in my sleep. By chance, I was heading to London for a conference for the next two nights so I only had to put up with it one night. When I got back Thursday night, it had been fixed. Today at work we got Pizza Hut pizza for lunch. Even though I'm not particularly a fan of Pizza Hut in America, I was hoping that it would be decent American deep dish pizza. It was not. I wasn't involved in the ordering so its possible deep dish pizza was available, but the pizza we got was the pretty standard British style pizza. That said, it was pretty good pizza. Just not what I was hoping for when I heard Pizza Hut. Along with the pizza, we got a bunch of sides including wings. The cheese covered garlic bread was pretty good. We also got chips (french fries) which I thought was typical but still kind of strange given the restaurant. I've been busy lately planning some trips. In two weeks, I'm heading down to London for the weekend. I've never been to London before, not counting sitting at Heathrow for several hours, so I'm looking forward to going down. One of the major things I have planned is that I had my MP arrange a tour of Parliament for me. I'm taking the Caledonian Sleeper train down so that should be an experience. In December, I'm going to Munich and Austria for five days. I'll fly into Munich and spend two nights there. I'll then take the train to Salzburg and spend a night there. The trip ends in Vienna. I decided to go in December so I can experience all of the Christmas stuff going on. Hopefully its not too cold. The site was situated to be torn down for redevelopment into condos and such. The part of the site with smaller buildings was torn down prior to me finding it the first time. I heard that the rest was leveled by late 2008. So you can imagine my surprise when I randomly came across it again a few weeks ago. Other than replacing the chain link fence with a more formidable solid blue fence, it looks like not much has happened in the past two years. I took a couple of pictures but they're hard to make out since it was pitch black at night. I've matched them up with ones from 2007. See them after the jump. I plan on going back during the day and will hopefully get some better pictures. Last Saturday I bought some oak smoked cheddar cheese from the Stirling Farmer's Market. Its from the Arran Island, which is a small island off the western coast of Scotland. However, when I decided to have some of the cheese a couple days later, I ran into a problem. I've uploaded some pictures from the past couple of weeks. You can find them here. My British provisional driving licence came the other day. According to the codes on the licence, I can now drive agricultural tractors, "mowing machines or vehicles controlled by someone on foot", and mopeds. You need a licence to be able to mow your grass, particularly with a riding lawn mower? Why are they allowing anyone who wants a car licence to be able to drive tractors on the road? The licence itself looks like I made it in five minutes in photoshop. It doesn't even specifically say where its from. I understand that its based on the EU standard design, but you would think the country name should be somewhere. If you were to show it to someone in America, they would probably think it was a fake. After the Hibs game yesterday, I headed down to Franco's on Summerhall Place to try a deep fried pizza. I used to live across the street from Franco's and had first seen a deep fried pizza there so I figured it was the place to try one. A deep fired pizza is simply the cheapest deep dish frozen pizza thrown into a deep fryer. Do not believe the misinformation that other websites are spreading, it is not battered. 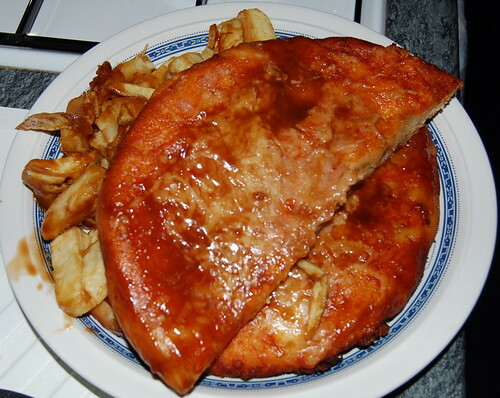 It is properly served with chips and salt & sauce, never with vinegar. I was surprised how good the result was. Not quite as good as a properly done deep fried Mars bar, but still quite tasty.Its not something to eat everyday, but I'll be ordering another soon. Credit to the guy I stole the picture from. Here is a picture I took of Stirling Bridge and the Wallace Monument. I think it turned out pretty well. Last Saturday I took a short trip to the Falkirk Wheel. The Falkirk Wheel is basically a large boat lift that lifts boats from one canal up so they can travel on the other canal. Its actually pretty cool to see the thing in operation. It was a beautiful day so I had this nice walk along the canal to get to the Wheel. I was surprised that there was more to do at the Wheel than just watching it spin up and down. While walking around, I found Santa Claus's grotto. Hugh Hefner may have his grotto in LA, but Santa chose to have his in the middle of nowhere outside Falkirk, Scotland. Today I visited water and sewage treatment plants for work. It was actually a pretty enjoyable experience. I didn't mind the smell but one girl used her scarf to try to filter out the smell. 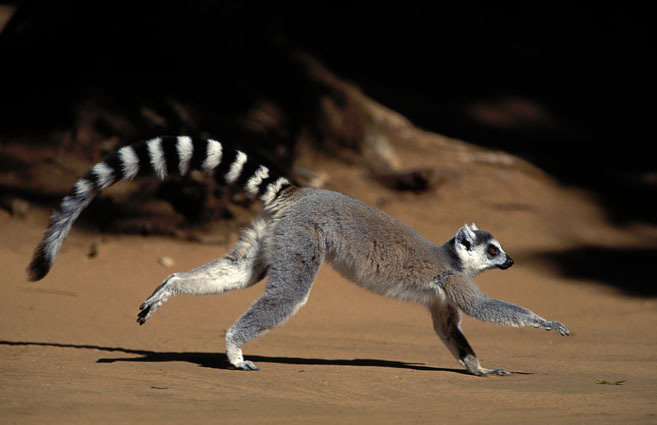 Runnin' with lemurs/ no time for beaver? Heard this song tonight. I thought the chorus went "runnin' with lemurs/ no time for beaver". It turned out that its not, but a song about lemurs would be awesome. First, I want to say hello to the couple people in Japan and Brazil who read this blog. Before I came over, I had read online that some people have problems opening bank accounts since they do not have proof of address or for other reasons. Since I had no problem opening my account, I figured I'd post my experience here. I decided to go with Lloyds because the vantage feature on their current accounts seemed to offer the best rates. The local branch is also on my way to work and is open Saturdays. I walked and told the guy at the "help desk" that I wanted to open a current account. He asked to see some ID and I showed him my passport. He handed me off to a person in the back. She made a copy of my passport photo page and also my visa. Nothing about proof of address. We then went though the standard questions, like name, address, birthday, employment status & length of employment (started the following day in my case), length living at the address (1 day), net monthly income, etc... I ended up opening a silver current account, which has a small monthly fee. I asked about the free account, but she kept trying to up sell me. The account does have some additional features that are kind of useful, like mobile phone and travel insurance, but I don't think I'll get my money's worth out of the fees I would pay over the course of the year. I'll probably downgrade after the introductory fee period ends. I also was given a small overdraft which surprised me. Got my debt card in the mail like 2 days later, followed by my pin and cheque book. So in summary, the process was really easy. Looking back, I'm not sure why I was concerned in the first place. Over the past three weeks, I have been going around and doing things that government conspiracists would consider being put into "the system". I guess that I won't be able to live like an illegal immigrant now. I've registered with a doctor, opened a bank account with Lloyds TSB Scotland, received a national insurance number, and have a British American Express card on the way. I also applied for a European Health Insurance Card. All I needed now is to get a British driver's license and I'll be set. Today was payday so I'm now officially a British taxpayer, not that that is necessarily a good thing. For some reason, I'm on tax code BR and paying emergency tax. This means I'm did not get my tax free allowance and all of my income for the month was subject to taxation. I'll get the extra amount back but its just a pain, especially since my first paycheck was smaller because I didn't start working until the second week. The plus side is that I can now use all those Revolutionary War slogans to complain about being taxed without representation in Parliament. I'll have to get some Patrick Henry and Sam Adams pins for my backpack, but only if I can get them without paying VAT. My office has this great view of the Ochil Hills. Here is a picture I found taken from the roof of the high school next door. This picture really doesn't do it justice. Sorry for the lack of updates, but the good news is that this post is this blog's first from Scotland. My visa finally arrived at the end of August. I immediately booked a flight from Newark to Edinburgh for the night of September 1. I crammed all of my stuff into Space Bags and then into a suitcase and a large wheeled duffel bag. The duffel bag was a good choice since its starting weight was much less than the suitcase. This goes a long way in making sure that you stay under the 50 lb per bag limit. I arrived in Edinburgh on the morning of September 2. Continental's direct flights between Newark and Scotland are a good product, especially when you get an exit row seat with an empty seat next to you. The food on the flight is pretty good and the VOD is good enough. After collecting my bags in EDI, I had the fun of maneuvering my two bags through the airport to the ATM right on the other side of customs, then to the kiosk to buy an airport bus ticket, and finally making the turn in the railings for the bus queue line. This is where the shortcoming of the duffel bag became clear. It was a lot harder to keep the bag stable while trying to do anything other than move straight. Since this blog has been lacking in Scottish content, here are my two favorite Scottish TV advertisements. The previously mentioned Stone Roses tribute band, The Complete Stone Roses, recently released an original song of their own. Entitled "Tell Me Moses", the lyrics of the song are made up of the titles of Stone Roses tracks. Kind of gimmicky, but its pretty good for what it is. The song was sent out to everyone on their mailing list for free but you can download the song here. 2009 marks the twentieth anniversary of the release of the Stone Roses's self-title debut album. 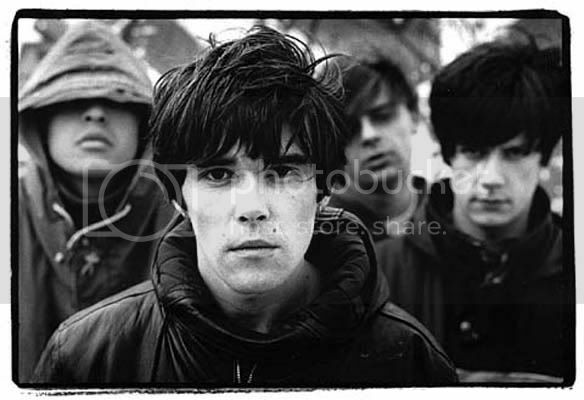 For those of you who are not familiar with the Stone Roses, simply put, they are the greatest band of all time. In 2006, NME Magazine (its kind of like the British Rolling Stone) name their debut album "the best British album of all time." You can listen to most of their stuff here. As part of the 20th anniversary, they are release a couple different versions of the album, including an absurd $120 collection of CDs, vinyl LPs, John Squire's artwork, and a book. There's a tribute group known as the Complete Stone Roses. They're playing a gig in Edinburgh on October 3rd that I'm looking forward to going to. EDIT: I found these cool T-Shirts but I don't know where you can buy them. In other news, I got an invite for Google Voice the other night. I haven't played with it a whole lot, but it looks pretty interesting. As you are signing up, you get to search for different numbers that are available. You can search by letters too if you're looking to get a number that represents part of a name or word. After you pick a number, you then link your cell phone, home phone, etc... The major feature of Google Voice is that your new phone number will ring all of your numbers when someone calls it. It also serves as a voice mail service. You can listen to your messages from any computer, and Google will also provide a transcript of the messages. You can also make free calls and send free text messages. Tomorrow night I'm probably going to go to the fair being held near my house. It's pretty small but I used to help out there when I was younger. My dad and I built the ring toss game. My eagle project was at the fire company that hosts the fair so I'll probably stop by to see how my project is holding up. Want to see what 400 trillion dollars looks like? Yes, this is real money. Because of rapid inflation, Zimbabwe had to issue banknotes with obscene numbers of zeros. The largest were these 100 trillion dollar notes. Shortly after beginning to print these notes, even 100 trillion dollars wasn't enough. You'd be lucky to get a egg for one of these. The only thing that they're good for is that I can now claim that I'm a multi-trillionaire. I'm probably going to be the only multi-trillionaire in Stirling. Pennsylvania ('s budget) is a month late. Maybe Eddie Rendell should take her for a pregnancy test. Oh wait, there's no money to pay for it. Seriously though, that situation is pretty ridiculous. The fact that they've been stuck over the same issues for months and made little to no progress makes it all the worst. With major employers threatening to leave the state, they shouldn't even be considering raising taxes. You can raise taxes all you want, but if no one has a job, no one is going to be paying them no matter what level you set. Now that I'm closer to leaving, posts should start to come more frequently. This past week was spent gathering what I want to take with me and getting rid of stuff that I don't want anymore. I went through my closet and found a bunch of old T-shirts that are too large. I pulled them out and will donate them to the Salvation Army. This morning I went bought a new suit and a couple of neckties. I've been spending sometime researching bank accounts. I had heard that opening a bank account can be a problem since you have no proof of address. Apparently, there are a couple of banks, like Barclays and Lloyds, that don't require you to prove your UK address. They are willing to accept proof of your old address in America. That's good news and its one less thing to worry about. I've also heard recently that most landlords are more flexible for people just arriving with no history of credit in the UK. Right now the cost of this meal is $3 since all sodas are currently $1. Compare this to the quarter pounder value meal which is easily $2.50 more, almost twice as much, and only comes with a medium soda. I've recently noted a worrying trend, the lack of menus in fast food restaurants. I first saw this in a McDonalds on the high street in Kirkcaldy, Scotland (the one across the street from the house that Adam Smith was born in). The place had menu boards above the counter, but they only had the promos they were running and the combos. They did not have the individual items you could order. Even worse, I was in a Burger King that was serving breakfast but only had lunch menus up. I had to order by guessing what they would have based on a vague recollection of what an American Burger King would serve. They also didn't have trash cans but that's another story. At first, I thought that it must be a UK thing, but I was at a McDonalds today in Pennsylvania and they also had this menu boards that really don't tell you anything. It didn't even have the dollar menu. How do they expect you to know what they have and how much it costs? Its a heck of a thing if you wanted to order something other than a hamburger combo. I can't image how this helps their business. What's the point of selling items if you don't let people know that you're selling them? As a side note, there's been a gap between my posts since a bunch of stuff came up that complicated my visa. This move looks like it going to be a pretty frantic one. 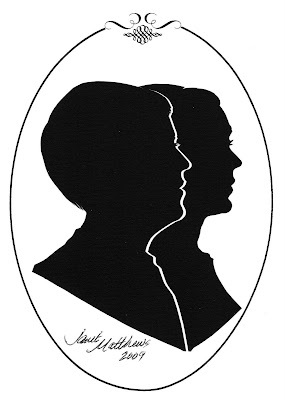 When I was in Florida the other week, my brother and I had a silhouette done of the two of us. It was done complety freehand with just a pair of scissors. I thought that it turned out pretty well, at least for me. Not sure about how my brother looks. Since when did really fat people start to ride those motorized wheelchairs normally reserved for old people? If you're 30 years old and so fat that you can't walk, maybe visiting theme parks should be a little lower on your priority list and losing a hundred pound or so a little higher. Just a suggestion. Letting people ride around and never have to walk is just giving them a license to be as fat as they want with less of the consequences. At least old people are considerate when driving their scooters. At the same time, people with strollers aren’t much better. They start and stop walking without warning and cut others off left and right. People should really think twice about where they take their really young kids. Do you think that you have to push your two year old child on a hundred degree day through large crowds? The kid isn’t going to enjoy where ever you’re taking them and it’s not like they’re going to remember it anyway. All you’re going to do is punish yourself by having to lug the stroller around all day and irritate the people who have to walk around you. When I went to Disney World when I was around seven years old, my family had a late dinner reservation at the restaurant in the castle at the Magic Kingdom. By the time we were done eating, the park had been closed for a while. It was completely empty. We got to walk down the main street with no one else around. It was pretty cool to be able to see the park all lit up at night while it was empty. On Monday, I'm traveling to Lancaster to take the LSATs, which is kind of a pain. You would figure that living outside the city that is the state capital you would have something closer. Instead I'm going to have to drive an hour and then take the test. At least its being given in the afternoon and not in the morning like it normally is. I'll be glad when this is done. Preparing for the test has not been particularly fun. At least after this I'll be free until I have to start seriously packing. As for my visa status, it arrived at the LA consulate on Monday. I'm guessing that it will probably take another week before I hear back. I've heard that they normally send an email confirming that they have received your stuff. Since I didn't get one, it possible that my passport will show up with the visa in it any day. Hopefully it won't come while I'm away on vacation. This past couple of days has been spend getting all of my visa stuff ready to be mailed to this British Consulate in Los Angeles. My diploma happens to be written in Latin, which presents a problem since the UKborder Agency only accepts documents in English or Welsh (what about Gaelic?). Normally you have to pay to have someone do a translation, but that wasn't an option since I just graduated and didn't have the time. So I had to send along a letter from my college, transcripts (the hassle of getting these is another story), and an enlargement of this really little card that came with my diploma. All this was mailed to LA along with bank statements, passport, a picture, and the two applicants packets. As part of this process, I had to go to this office next to the county jail to be finger printed and photographed. It turns out that it’s hard to take my fingerprints. The pattern makes it difficult take them and to match them. The scanner's software kept trying to reject my prints because they had too low of a "score". The women tried one finger five times before giving up. I wonder if this means I'm well suited to be a burglar? In case someone other than my parents or friends actually find this blog and decide to read it, I figure I should write a brief intro. I've recently graduated from a small liberal arts college and will be moving to central Scotland in July to work there. I first went to Scotland in the fall of 2007 to study at the University of Edinburgh. You can find pictures from that trip in the link on the right hand side. In the winter of 2009, I applied for a job there. After a couple of phone interviews, they paid for me to fly to Glasgow for more interviews and I was offered the position. I intent to use this blog mainly to record my preparations to move from Pennsylvania to Scotland, and once there, to be more of a travelogue of my misc adventures and daily life. I'm sure it will evolve over time as what I feel like writing about changes and my life becomes more regular. Right now, I'm hoping to maintain some degree of anonymity so I'm going to try to stay vague on personal details, my future employer, etc... For my random internet readers, I hope that you find some value in this blog. One of my goals with this blog is to provide some insight into some of the bureaucracy that Americans moving to the UK go through. I also hope that someone is able to laugh at my exploits.